The practice of ice skating is common in many countries around the world. 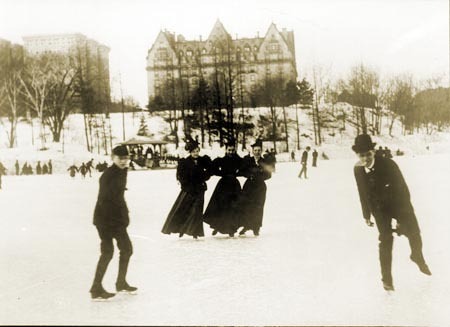 It usually takes place on man-made ice rinks nowadays, although “cold” countries like Sweden and Canada, for example, keep the tradition of skating on frozen rivers and lakes very much alive. Archeological findings suggest that it had been around for thousands of years – whether as a recreational activity or as a means of transportation – before it spawned various types of competitive sports in the modern age. The most primitive form of ice skating (dating back to ancient times and probably originating in Europe) involved skates made out of bones to slide over frozen bodies of water. Early skates were very basic in concept and consisted of a flat surface that skaters used to glide on ice. It is believed that the Dutch brought the significant advancement of integrating blades to the skates as early as the 13th century. Once the blades had been invented, ice skates would not undergo any more major changes. The only notable one came much later and consisted of attaching the blades to the soles of dedicated shoes. These are the modern skates as we know them, whose primary characteristics are increased balance and sturdiness. Figure skating, the sport’s most artistic and perhaps most popular form, elegantly combines dancing, gymnastics and skating. It has been around for hundreds of years in a very rudimentary and austere form, probably due to the fact that ice skating had for a long time been reserved strictly for Europe’s wealthy elites. In the mid-19th century, Jackson Haines (an American from New York) revolutionized the art by adding to it a variety of bold and energetic moves. Haines’s style turned him into a phenomenon and helped him win the U.S. championships before moving to Europe. It was in Vienna, Austria, that his new form of figure skating really caught on and was later developed into a full-blown sport with a complex set of rules. Figure skating then made its way back to America as a truly international sport and became more institutionalized. It is today governed by an international federation and is a very demanding sport; in fact, most Olympic skaters have been skating for most of their lives. Amateur status used to bear a lot of significance in the world of figure skating. Until 1995, competitive (Olympic) ice skating was a strictly amateur discipline with no financial compensation. As a result, many Olympic skaters decided to cut their careers short in order to join the more lucrative entertainment industry, which prompted the international federation to amend the rules and allow figure skaters to earn money. Figure skating is a prominent fixture in the Winter Olympics and remains very popular in the entertainment world as well. Other disciplines entered the Winter Olympics, such as speed skating and short-track speed skating (which take place in an oval-shaped rink and for which athletes use much longer skates), and of course ice hockey, which is a very popular sport in Scandinavia, Eastern Europe and North America.